2-Way vs 3-Way Valves: Which Type is Right for You? Valves play a crucial role in almost all industrial processes. These devices regulate, redirect, or control the flow of liquids or gases by opening, closing, or partially blocking flow passages. There are numerous types of valves, each differing in various ways, including operating principle, configuration, power source, and application. The main components of a Baelz control valves are the actuator, plug and spindle, and the valve body. The actuator, which can be either pneumatic or electric, controls the valve plug by moving it up or down in varying strokes. 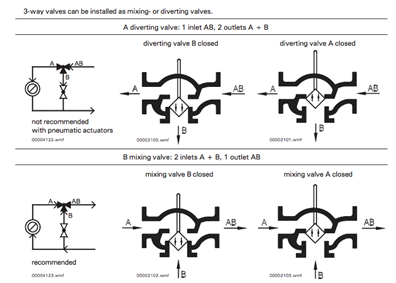 2 way and 3 way valve classifications are commonly used in industrial applications. These valves are defined by the number of ports they use. 2 way valves, as their name suggests, consist of two ports: an inlet port “A” and an outlet port “AB.” On the other hand, 3 way valves consist of three ports: “A,” “B,” and “AB”. Since these valves support different flow rates, temperature ranges and pressures, it is important to understand their differences before determining which type of valve is appropriate for your application. When fluid enters the inlet (port A) of a 2 way valve, the relative position of the plug dictates the amount of fluid allowed to leave the outlet (port AB). When the plug and spindle are positioned all the way up, the valve is fully closed from ports A to AB. Conversely, when the plug and spindle are fully down, the valve is open from A to AB. The B port is fully capped off with a blind flange on all Baelz 2 way valves. Percise plug positions will control the flow rate through the valve. 2 way valves are commonly found in basic on/off applications, where they are frequently referred to as isolation valves. These valves are an essential component in many process safety systems, as they can immediately stop fluid flow to a specific location in the event of an emergency. 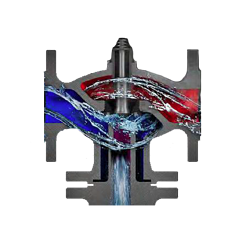 2 way valves can also be used in variable flow systems that experience changes in pressure, temperature, and flow. For instance, these valves can regulate operating temperatures by using sensors to adjust to specific fluid parameters to maintain the desired temperatures and flow. For some chilled or hot water applications, 2 way valves are also an ideal solution. Plug and spindle valve positions can be adjusted to ensure that the system in question operates within the optimum efficiency range (typically when the valve is 30-80% open). Functioning within this range prevents equipment damage and also extends the valve’s life. When used correctly, 2 way valves can increase process efficiencies and lower operating costs by providing operators with the ability to run heating and cooling systems at variable flow rates. 2 way valves are used in almost every industry application that requires the regulation of process fluids. This includes the automotive, wood, chemical, food and beverage, power generation, marine, and water treatment/wastewater industries. >> Request a quote today! 3 way valves contain the same components as 2 way valves. What differentiates it from the 2 way valve is the use of an additional port. Like 2 way valves, 3 way valve assemblies can also be controlled by pneumatic or electric actuators. These valves can be used to either divert the flow of fluids, or to mix fluids from two inlets delivered through to a single outlet. When used as mixing valves, fluids from inlet port A and B are mixed inside the valve body and subsequently transmitted out through port AB. Mixing allows for the combination of fluids with varying temperatures and pressures to be combined sent through an outlet with specific desired properties. When used as diverting valves, port AB functions as the inlet, while Ports A and B function as the outlets. When the plug and spindle are 100% in the upward position, Port A is blocked, thus allowing flow only from AB to B. When the plug and spindle are 100% in the downward position, flow through Port B is blocked, and flow is only permitted from AB to A. 3 way valves are more cost-effective for diverting and mixing applications than utilizing multiple 2 way valves. The ability to mix fluids from more than one inlet makes 3 way valves ideal for heating and cooling various media such as water, oils, and chemicals. These valves are also commonly used as bypass valves in primary and secondary loop applications. Similar to 2 way valves, 3 ways valves are also used in the same process industries previously mentioned. Baelz’s 2 way valves and 3 way valves are constructed from specially selected materials to ensure maximum durability and reliability. For instance, our stainless steel bellows supports movement up to 120,000 up and down reps at a maximum temperature of 350°C / 662°F. Our valves are able to support this type of performance due to a durable and high-end stuffing box which supports the life of the spindle and bellows. As an industry leader and premier distributor for North America, Baelz NA also offers an expansive catalog of parts and components for an expansive range of valve solutions. If you would like to know more about our 2 way or 3 way valve systems, contact our technical team or request a quote today. Talk With A Sales Rep!